Great ambience, seamless service, delicious food, and reasonable pricing are qualities we all look for in a restaurant. But more and more diners are seeking out restaurants that showcase the best of local produce too. 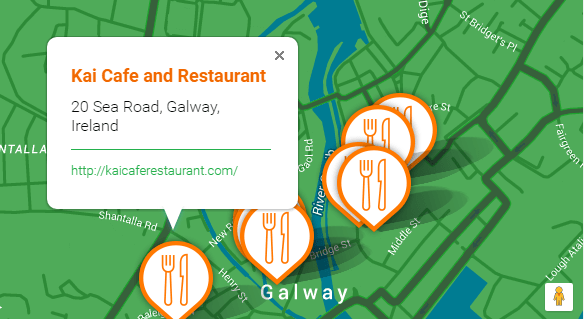 Today, Bord Bia launches a new interactive map featuring 65 award-winning restaurants across the country as part of their Just Ask initiative. All of the featured restaurants have been selected by Bord Bia for excellence in sourcing and serving local foods. Developed in response to consumers’ increasing support of local foods, the Just Ask map will be a vital tool for Irish foodies and international visitors alike to easily locate award-winning restaurants close by for a meal featuring the best of Irish foods. Now in its seventh year, the Bord Bia Just Ask campaign has been wholeheartedly embraced by the restaurant trade. The campaign encourages diners to look for information on where the food on their plate comes from when eating out – if it’s not written on the menu, then Just Ask! Likewise the campaign encourages chefs to provide this information on their menus, and it has been warmly embraced by the restaurant community. Each month, Bord Bia and renowned food writer Georgina Campbell award a Just Ask Restaurant of the Month to recognise best practice in transparency in food sourcing, encouraging engagement in food provenance. Just Ask judge and food writer Georgina Campbell said: “The Just Ask Award celebrates these pioneering businesses who are at the forefront of producing exceptional food and first class customer service. It’s really encouraging to see so many restaurateurs leading the way in sourcing local produce, and what better way to celebrate this than with an interactive map which provides Irish consumers with some guidance on where to eat to ensure they are promoting local foods”. The map includes 65 restaurants, including past winners of the Just Ask restaurant of the month No. 5 Fenn’s Quay Restaurant Cork, Oscars Seafood Bistro Galway Restaurante Rinuccini Kilkenny, and The Winding Stair Lower Ormond Quay, Dublin.